The Farm is identified by this often-driven-by sign, cleverly hidden by vegetation on the side of Farm Loop Road. Spring Creek Farm sits on the outskirts of Palmer, Alaska, a small, rural community about forty miles north of Anchorage. In the mid-1930s, some two hundred-odd Midwesterners, mostly in their late twenties and early thirties, picked up their families and moved to the Last Frontier as part of Roosevelt’s New Deal. 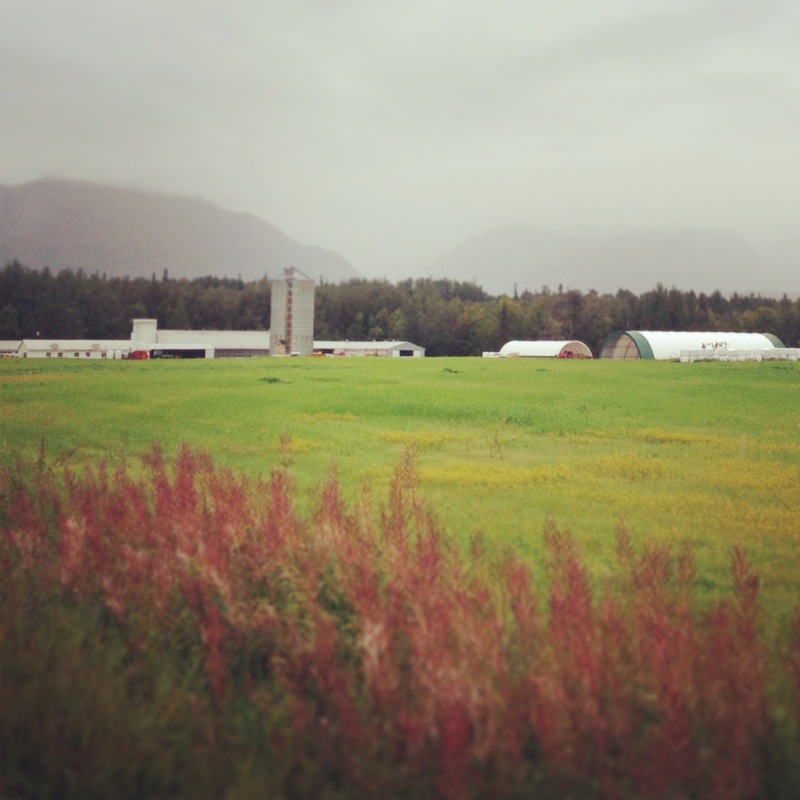 The Matanuska Colony has existed in various incarnations since then, and today, the sleepy township of Palmer is home to just under six thousand people and, still, plenty of dairy cows. The Farm’s eight hundred acres, nestled in the foothills of the mighty Talkeetnas, sprawl across fields and forests, swamps and steams, including its namesake, Spring Creek, which, when frozen over in the winter months, makes an excellent venue for broomball and snowshoe races. Spring Creek Farm is also home to Alaska Pacific University’s Kellogg Campus, so named for the property’s late owner, Louise Kellogg. Louise wasn’t a colonist, because she was busy serving in the Women’s Army Corps when her fellow Midwesterners were breaking ground in Palmer. In 1948, finished with her commitment as a First Lieutenant, Louise moved from her hometown of Chicago to Alaska, where no one would sell her any property because she was a single woman moving to Alaska in 1948. 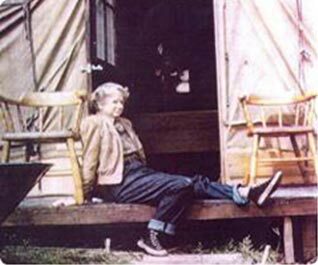 In one of the most iconic photos of Louise—who in 2012 was inducted into the Alaska Women’s Hall of Fame—she sits in front of a wall tent as her farmhouse is being built. 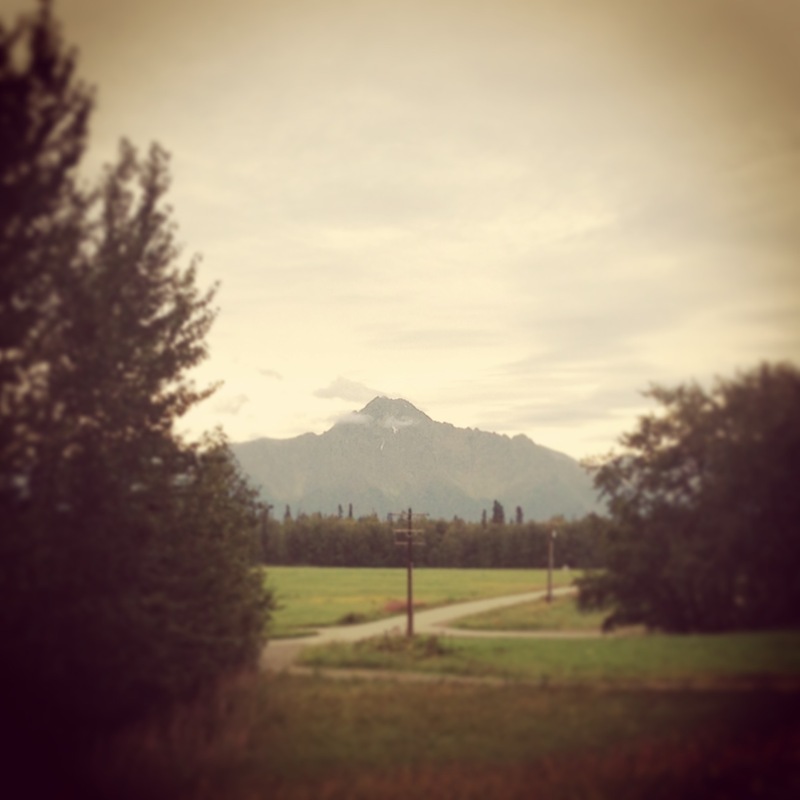 Eventually, the tenacious Louise bought 240 acres from a widow in the Matanuska Valley. The property came with ten milking cows, a tiny cabin, and an unfinished barn. Louise lived in a tent for three months while her farmhouse was completed, then moved in and proceeded to out-farm all the competitors who’d refused to sell her their land. One by one, the farms around her went belly-up, and Louise bought up their land until she had 120 cows and a state-of-the-art milking barn. Isn’t that a great story? Once she’d become a Matanuska farming tycoon, Louise spent her remaining years volunteering and serving on various boards, including APU’s. (She was turned away from the UAA board because—you guessed it—she was a woman.) The Dewolf-Kellogg Trust, which allots Spring Creek Farm’s acreage to APU, was created in 1973, and Louise insisted that the land was to be used for environmental education. 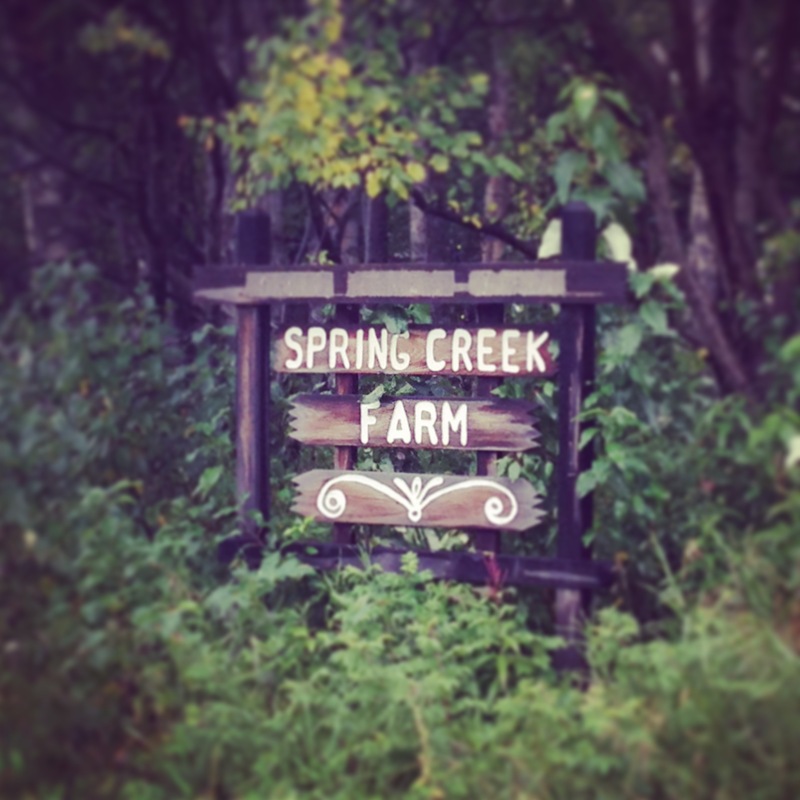 Thirty years later, Spring Creek Farm is home to my graduate program, as well as Louise’s Farm School, a homeschool co-op for five- to twelve-year-olds run by grad students and aimed at teaching kids about environmental responsibility and sustainable living. It’s all very Dar. This was the scene I found when I arrived in Palmer last fall, and again on Friday night, when I made my quiet re-entry to the Last Frontier. Gil picked me up at the airport, and we pulled in just after midnight to find the contents of the new cohort spilling out of the Kellogg House and into the parking lot, making weekend plans and shouting cheerful goodbyes. The view of Pioneer Peak from the spare bedroom of the Kellogg House is pretty excellent. I made my way up to one of the spare bedrooms, where I’ll be staying until we can move into our apartment in the city. It was lonely, sleeping in the big farmhouse all by myself, and as the house creaked and groaned, I remembered our frequent jokes about the late Louise herself, supposedly a nightly visitor to those taking up residence in the farmhouse. I slept fitfully and woke up hours before I needed to leave for a job interview in Anchorage. I spent the morning puttering around the Kellogg House, eventually breaking down and running into town for some toothpaste and returning just in time to mooch some of Caitlin and Gil’s breakfast. I guess dirtbag habits die hard. It poured the whole way to Anchorage, and it was still coming down when I walked out of my interview. Most of my friends were busy finishing up jobs and honeymoons, and for the first time in recent memory, I had nowhere to be. No immediate plans, no one waiting for me at home, no one who needed to be let outside to bark at squirrels. I considered running on campus, knowing there wasn’t a single trail I could run that wouldn’t remind me of Lucky. I had a case of the sads, but I knew what his solution would be: I needed some exercise. It was raining proverbial cats and dogs when I pulled up at the trailhead, and it added to my already sour mood. As the rain soaked through my clothes and dripped down my face, I allowed myself to feel deeply, dreadfully sorry. I missed the camaraderie I’d seen in the new cohort the night before, and I was sorry my own little Alaskan family had changed. I was sorry our first year, with all its daily victories and defeats, had ended, and I was sorry some of my friends were leaving, or had left already. I was sorry Lucky wasn’t racing me back to the car, where I’d do my best to towel off his wiggly body as he peppered me with muddy pawprints. I was sorry I hadn’t recognized how much I’d miss what I had when I had it. Even on a rainy day, it’s not a bad place to call home. A few miles down the trail I stopped and gawked at the jagged peaks around me. A few months ago I’d skied up this same trail to the Mint Glacier. How different they looked now, naked and gray, without their snowcaps and avalanche chutes! I stood there a long time in the rain, letting it wash over me until I was too cold to stand still anymore. As I fell asleep that night, I thought of Louise, who never married. I thought, It must have been lonely sometimes, in this big, cold house. The more I thought about the house, though, and the farm and the people on it, the less I felt alone, despite that it was just me and Louise. I have more than just memories tying me to this place. My dog is buried here. My friends live here. I love this place. My mostly-warm memories still exist, but it’s time to start a new chapter. It feels good to be home. Next postFree soloing the First: A story in which I make a few good and a few bad decisions, and ultimately am a little smarter. Emma, I was moved by the courage and honesty expressing your emotions: feeling and accepting your loneliness; taking responsibility; and choosing to see endings as new beginnings. Thanks for modeling such a healthy way to move through life’s challenges. What a great inspiration!